CData Software provides standards-based drivers and data access solutions for real-time data integration. 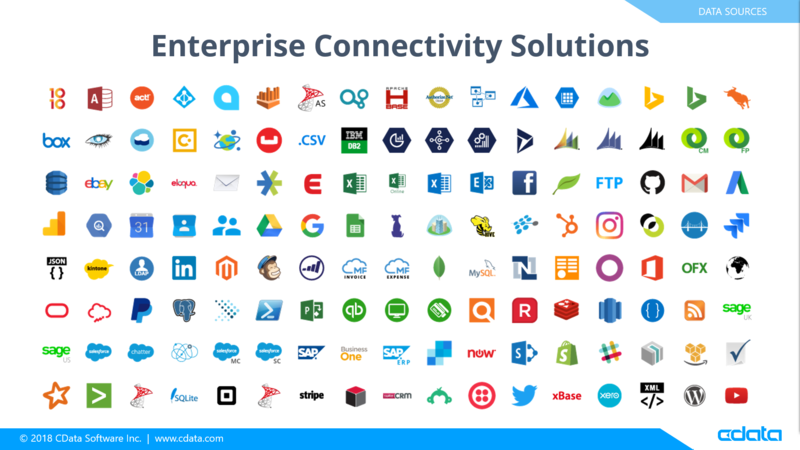 CData’s suite of tools simplifies how users and applications connect to data found in on-premise and cloud-hosted web APIs, apps, databases and data warehouses. CData Drivers integrate with 100+ data sources, including platforms for accounting, collaboration, finance, e-commerce, ERP, CRM, marketing automation and other niches. Examples include Salesforce, QuickBooks, Google Analytics, and HubSpot. The drivers support the following technologies: ODBC, JDBC (Java), ADO.Net, SQL (SSIS), OData, Power BI, BizTalk, Mule, Excel, Powershell and Embarcadero (FireDAC). In addition to the drivers for 100+ data sources, CData develops custom drivers upon request and provides additional data access solutions, including: CData Cloud Hub — a cloud data connectivity tool; CData Sync — a solution that automates continuous data replication for on-premise and cloud databases from 100+ destinations, and API Server — a tool to quickly, codelessly create custom APIs for back-end data. Data is important to core business functions, but it can also be highly complex and expensive. Based on CData Software reviews, the tool maintains, integrates, and manages data connectivity for easier digestion and aggregation of information. It simplifies gathering and delivering meaningful insights in separate silos. CData Software offers an end-to-end solution for integration. It has various tools, data drivers and providers to connect with major databases. In fact, its drivers support major applications such as Excel, BizTalk, ODBC, JDBC, OData, SSIS, and ADO.NET. The drivers offer real-time access to on-premise and cloud-based web APIs, databases and applications. CData Software automates the complex processes involved in data integration. The CData Software reviews on the web often mention how the tool can free up time for engineers to focus on more crucial aspects of the development with full scalability and quality control.